Please note: 100% cancellation refund is available if cancelled prior to 60 days before arrival date. There is a $250 administration fee deducted from this amount. Nestled on two wooded acres on the south shore of Goshorn Lake, the Goshorn Lake House features accommodations for 12 guests. The air conditioned home includes 5 bedrooms and 2 bathrooms. Spacious front and back entries, living room, dining room with seating for 10, kitchen and a family room (with pool table) complete the home. A multi-tier patio off the house faces the lake and provides comfortable seating with sun and shade. The private dock is perfect for fishing, swimming, boating and other water sports. A canoe and pedal boat are available for your enjoyment. A sandy beach provides a place for kids to make sand castles. A large wooded yard provides opportunities for games and privacy. Near the beach, a picnic table is provided for your enjoyment. Abundant off street parking allows for vehicles to come and go without the need for shuffling. Bathrooms include bath towels, hand towels, wash cloths, and beach towels. Also provided are facial and toilet tissues. Central Air Conditioning throughout the house. The house is heated and cooled by a central forced air system. Bath towels, hand towels, wash cloths, and Beach towels are provided. With a view of the lake, you can relax and watch the kids playing in the water. One television in the main floor living room and one television in the lower family room. Located in the living room. Board games, cards, chips, etc. Located in the family room on the lower level. Lush green grass, sandy beach on the lake and woods for exploring. A fire pit located about half way between the house and lake provides for a great evening gathering spot. Canoe and peddle boat are provided. Goshorn Lake is a 'No-Wake' lake. A canoe and peddle boat are provided. 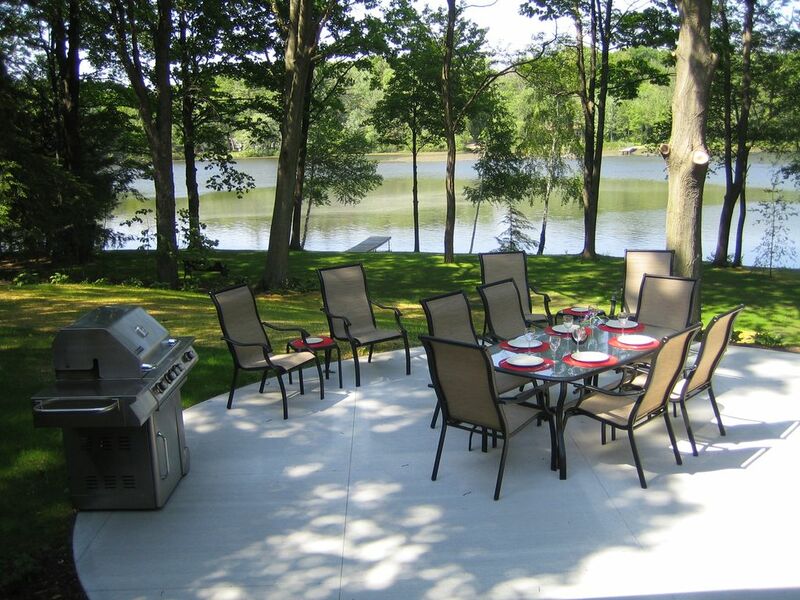 The patio, with seating and a outdoor dining table overlooks the yard and lake. books, family room with pool table, outdoor entertainment area, canoe, peddle boat, binoculars, living area, paper towels, central heating, Ducted Cooling, Intercom System, local activities guide, restaurant dining guide, laundry ,soaps, shampoo, toilet paper, towels provided. Very nice and clean. Comfortable. Beautiful view. Rob and Jon are very nice. They made sure we were comfortable. Had an incredible time staying at this gorgeous property for the second time. The grounds are gorgeous set on a quiet lake. House is incredibly clean. Already looking forward to staying here again next year. Our extended family had another enjoyable stay at the lake. The property is beautiful and the house comfortable. John and Rob are very responsive, answered messages within minutes. There is plenty to do and see in the area. We look forward to our return next summer. This property is everything it promises to be. Huge gorgeous lot with several places to sit; immaculate small perfect beach for kids; paddle boat and canoe; pier for fishing. The house is very clean and comfortable with fully equipped kitchen. Lower level has the bedroom with a queen and two twins, as well as bathroom w/shower, and large rec room with couch, chairs and pool table. Washer/dryer, upper level large bathroom with 2 vanities, tub/shower, 4 more lovely bedrooms, bath and beach towels. About the lake: you won't a cleaner, clearer, more beautiful swimming lake anywhere. It's just the best. The whole area has many things to see and do (Don't miss Lake Michigan), but you could be content for a long time just staying at the Goshorn Lake House. 100% cancellation refund is available if cancelled prior to 60 days before arrival date. There is a $250 administration fee deducted from this amount.